Ontong Java is incredibly remote. It is not currently accessible by plane (there is an unused airstrip), and is visited only erratically by supply ships. For this reason very few outsiders visit, a special charter vessel is needed to get there. 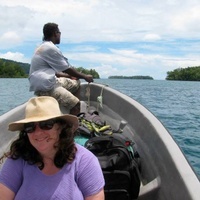 The Solomon Islands is a developing Pacific nation of around 900 islands spread over large area, most people have rural subsistance livelihoods, and there are few trained conservation ecologists. Some young, aspiring indigenous ecologists have recently graduated from the University of Queensland where they did extensive fieldwork on Solomon Islands species conservation as students. Employment that allows graduates to use these skills to continue protecting nature is scarce. The Ontong Java flying fox is listed 'data deficient' by the IUCN rather than threatened, so funding a conservation expedition for this species is especially difficult. The goals of this expedition are to 1) determine how sea level rise and other issues are threatening this animal, 2) find the best actions to take to save the Ontong Java flying fox from extinction, and 3) provide conservation leadership experience for Solomon Islander graduates. In August 2018, the expedition will travel to Ontong Java with the organisation Okeanos Sustainable Sea Transport Ltd, who have charter vessels based in Vanuatu. They use traditional Pacific style sailing vessels (vaka) that run on wind and coconut oil Okeanos. During two intense weeks we will find what can be done to mitigate threats to the Ontong Java flying fox, and at the same time help the local community, such as planting particular trees, or creating barriers to seawater surges. We will publicise the plight of the animal, its ecosystem and the indigenous people.